New Delhi: Just over four months after it chalked up a surprising yet convincing win in the general election, the Congress party, which leads the United Progressive Alliance (UPA), seems to be gripped by self-doubt as it gears up for the first real electoral challenge in the upcoming state elections due in Haryana and Maharashtra. This is in contrast with the past when the central leadership of the Congress was considered supreme, which analysts believe is part of a transformation process of the 125-year-old party. This trend has begun to manifest itself more clearly in recent weeks. In Uttar Pradesh, where party activities are directly under the control of Congress general secretary Rahul Gandhi, the state unit is divided and engaged in public spat with a sacked treasurer, Deepak Gupta, accusing the president, Rita Bahuguna Joshi, of “diverting funds meant for the election campaign". On 27 September, a supporter of Jagan Mohan Reddy, son of late Andhra Pradesh chief minister Y.S. Rajasekhara Reddy, vandalized a picture of party president Sonia Gandhi during a protest demanding appointment of the Kadapa member of Parliament as the next chief minister. On the same day, an order appointing Congress general secretary Digvijay Singh as the coordinator of matters related to Maharashtra election and the party’s alliance with the Nationalist Congress Party had to be reissued within an hour adding that defence minister A.K. Antony had been retained on the job. Besides, there are party leaders, including sitting legislator from Amravati constituency and a minister Sunil Deshmukh, who are openly challenging the leadership’s decisions on ticket distribution. Deshmukh has announced his fight against Rajendra Shekhawat, son of President Pratibha Patil, the party’s official candidate there. At least three Congress leaders separately admit that the dissent in the party, especially in state units, is getting “louder". “Although, it shows the democratic nature of our party, it is not so good as we are heading to face crucial elections," a Congress general secretary said on condition of anonymity. Maharashtra (where Congress-Nationalist Congress Party is in power), Haryana and Arunachal Pradesh, all of which are ruled by the Congress, are going for assembly elections on 13 October. The counting is on 22 October. Analysts say such developments are new in the Congress, in which the central leadership or party high command is unquestioned. “It never happened under (former prime ministers) Indira Gandhi or Rajiv Gandhi," pointed out Sandeep Shastri, pro vice-chancellor, Jain University and director, International Academy for Creative Teaching at Bangalore. But Shastri does not believe that such developments weaken the political prowess of Gandhi. Instead, he explains it as a new phenomenon taking place in Indian political parties. “There is a restructuring of power happening in political parties, be it (the) Congress or (the) Bharatiya Janata Party. If I put it rhetorically, centre of political power is not the Centre, but the states." It is only the second stint of the Congress party’s experiment with a coalition at the Centre. In 2004, they were an accidental victor. At that time they had come together with an alliance of 13 parties and the outside support of the Left front to form a government. In the April-May general election, the Congress won 206 seats, the highest since 1991. The new pressures on the central leadership have a precedent. 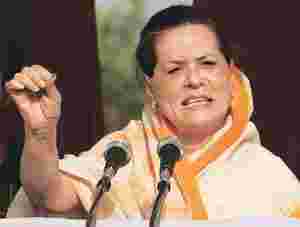 Ever since Sonia Gandhi took over as the Congress president, there have been various instances of rebellion against her. In 1999, three veteran Congress leaders, Sharad Pawar, P.A. Sangma and Tariq Anwar raised the banner of rebellion against her saying that Gandhi being a person of foreign origin could not accept the top political posts in the country. Yet, this did not deter their breakaway party, the Nationalist Congress Party, to be part of the UPA since 2004. Similarly, in 2005, former Kerala chief minister K. Karunakaran questioned her leadership and quit the party only to rejoin it after three years. Sonia Gandhi took over the reins of India’s oldest party in March 1998 and none of her predecessors since 1929—24 of them including the country’s first prime minister Jawaharlal Nehru—claim such a long uninterrupted presidency. The difference this time is that the aggressive state units are not proposing inclement action. Instead, they are seeking to carve out more autonomy for themselves and yet stay within the system. Jai Mrug, a Mumbai-based political analyst and psephologist, attributes the developments in the states to Gandhi’s style of functioning, too. “An advent of a strong leadership at the state level was never allowed in the Congress earlier. But with Gandhi allowing this, it happened that the party resources, machinery, money and capital concentrated on one or two individuals," he said, indirectly referring to the clout that Y.S.R. Reddy enjoyed. Congress leaders admitted it was the high command’s failure to create a second rung leadership that resulted in the current confusion in Andhra Pradesh. According to Lucknow-based political commentator Indra Bhushan Singh, the dissent notes also reflect the growing demand of cadres to share the power. “Congress is coming out of hibernation. When a political party becomes powerful and there is scope for more power, second and third layer leaders want their share of power." However, all the analysts agree that the attacks were not directed at Sonia Gandhi or her authority as the party president. “It is an indirect challenge to the central leadership or high command culture of the Congress party. But it would not be at Gandhi. Because recent developments have showed that nobody survived outside the Congress," Mrug said.